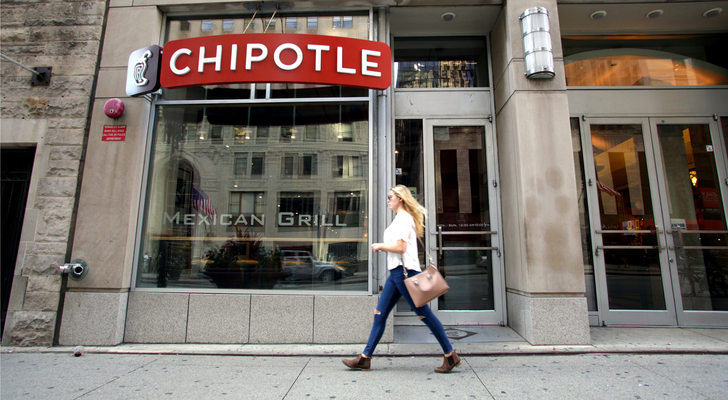 The bear case for Chipotle Mexican Grill (NYSE:CMG) ahead of earnings seems easy to make. Chipotle stock simply looks too expensive. Chipotle’s turnaround is making progress, but at 44x 2019 EPS estimates, CMG stock is pricing in all of that progress, and then some. Indeed, CMG now trades well above usually bullish analyst estimates, as James Brumley pointed out last week. It has the 32nd-highest forward P/E multiple in the S&P 500, according to finviz.com — and even that understates the case, as REITs and MLPs (which show low net income for accounting reasons) are undervalued by that metric. In the restaurant sector as a whole, only Wingstop (NASDAQ:WING) garners a comparable valuation (and it, too, looks overvalued). That sets up an important — and potentially dangerous — earnings report for Chipotle on Wednesday afternoon. The 30% gains in CMG stock from December lows are building expectations for the report. 2019 guidance will be key: Chipotle’s expectations must climb well above of those of analysts (and investors) to keep the rally going. I was skeptical toward CMG stock at the end of 2018 and I remain so ahead of earnings. But Chipotle has the chance to convert bears like myself with a big report on Wednesday. The bear case for Chipotle stock seems reasonably easy to make. The company admittedly is making some progress on its turnaround, after consumer fatigue and food safety concerns sent sales tumbling. Same-restaurant sales are up 3.3% so far this year, according to the 10-Q, with a solid 4.4% print in Q3. But CMG stock, again, is trading at 40x-plus next year’s earnings. It’s nearly 10% above consensus Wall Street price targets. The highest of 25 analyst targets, per data from Yahoo! Finance, only suggests about 15% upside. Those analysts seem to suggest that near-term expectations are too high. Yet the valuation here implies that even meeting expectations — a small beat in Q4 perhaps, and full-year 2019 guidance in the range of current estimates — probably isn’t enough. To move higher from here, CMG stock needs a blowout Q4 and above-consensus 2019 guidance. That seems like a lot to ask given those analyst concerns and the fact that Chipotle’s performance of late hasn’t been that impressive. Comparable sales numbers seem solid but are coming mostly from pricing increases. Traffic remains reasonably flat. Given the fixed-cost nature of restaurants, better-than-expected visitations can help margins and earnings, but it’s hard to argue that success on that front isn’t priced in to some extent. And with the options market perhaps surprisingly pricing in just a 7% move in CMG this week, investors seem too sanguine about the potential downside here if Chipotle misses. That said, Chipotle does have a chance to change the narrative around CMG stock. Much of the gains of late — Chipotle stock is up almost 70% over the past year — have come from optimism toward 2019 and 2020, not necessarily 2018 results. Again, I’m skeptical toward that optimism. But traders looking at the “easy” bull case here ought to remember that the short thesis might be too easy. Investors buying shares at $500 know that Chipotle looks expensive. They know the stock has outrun the Street. And those investors have a path to being proven right as soon as Wednesday afternoon. If Chipotle’s outlook matches those of the bulls, the growth story here re-emerges. A big Q4 leads to stories about how Chipotle’s traffic growth is returning and how the company might finally be putting those food safety issues in the rearview mirror. It might seem on its face that 40x-plus earnings already prices in that new narrative. But it’s important to remember that incremental margins for “fast casual” are quite high. Each extra visit to a Chipotle restaurant adds quite a bit of operating profit. If traffic returns, sales will accelerate, margins will expand, and CMG stock could move higher. Remember that this was a $700-plus stock just a few years ago. While I understand the bull case for CMG into and out of earnings, I still see at least some of the company’s potential as priced in by the run of the past few weeks. And from here, relatively light premiums on puts and put spreads suggest a potential bearish/short trade ahead of the report (for investors who understand the risks and option strategies required). Either way, this seems likely to be a key report for Chipotle. A Q4 beat and better-than-expected 2019 guidance mean the “turnaround” story strengthens, and investors of all stripes start treating CMG like a growth stock again. Anything less and Chipotle’s growth outlook appears much more moderate. The once-leader in fast casual looks more like other fallen angels in the space, and the 40x-plus forward P/E multiple likely doesn’t hold. So far, CMG has had a big 2019. Without a huge report on Wednesday afternoon, the rest of the year isn’t going to be nearly as positive.